This entry was posted on January 14, 2014 by nigel borrington. It was filed under Art and craft work, Landscape and was tagged with art, Digital art work, irish bogs, Kilkenny, Landscape art, mypaint, Nigel Borrington, painting, Tipperary. Very nice Nigel. Well done. This one likes it VERY MUCH. Could you elucidate on your methodology, please, Nigel? Are they photographic images over-worked? Or simply paintings based on photographs? very good! what program do you use? A pc app called Mypaint , I am thinking of getting Corel Painter x3 , but for the moment Mypaint is very good !!! Beautiful work, so serene! Greetings, Ron. Fabulous, love the sky colors. Thank you for the comment !!!! Don’t give up the painting. This is beautiful. Nigel, this is an amazing piece! It’s gorgeous, you should be very proud of your work! Can’t wait to see more of it! It looks like my favourite swamp plant, cattails. I love the way they look against the sky. Keep up this painting thing (although I also love your photography). Fantastic! Wow! 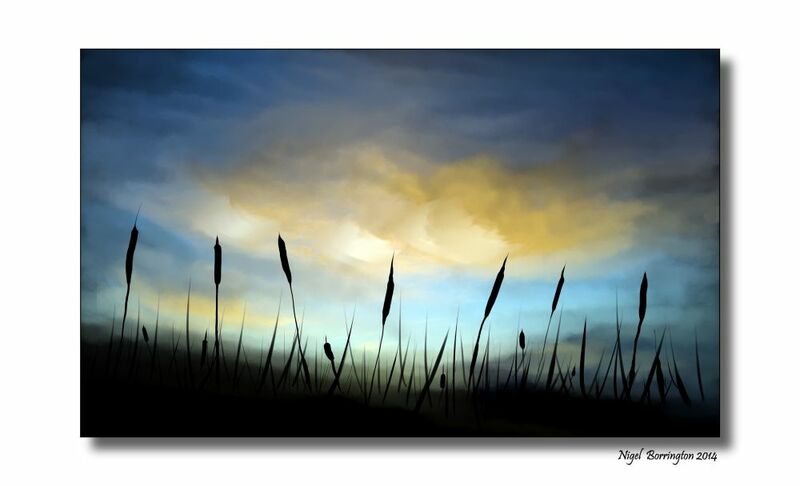 I love the silhouette of cattails, but I also love all the variations of tones! Much more to come I hope …. Love it!!!!! Keep on !!!! It speaks to me. Love.